The machine currently has just 1,000 miles on it, probably 2/3 at track days with no failures other than the occasional loose bolt and a broken aftermarket exhaust header that was replaced with hi end units (see below). Most Norton guys will tell you this is as nice a Norton (well sorted, handling, starting, power band, etc.) to ride as they have ever been on. The Fishtail instructors gave it very high marks for being very tight and just plain fun. Notably, this bike is fitted with an Alton electric start conversion that works every time. Kick start it in front of the Harley guys and good looking gals, but push the button the rest of the time. Our view is that the whole is greater than the sum of the parts. The vision for the machine was to be a stock plus performer, but with visual cues from cafe/track bikes and custom two-tone paint. We don’t cut, weld, bob or otherwise abuse these machines. Everything is bolt on and bolt off – if you want to take the bike back to stock or in another direction. Matching numbers 74 850 that started life as a Roadster, but came to us more or less as a barn find. Motor is 0.020″ over with a WebCam 312 camshaft, reground tappets and 0.010″ under big ends. New pistons, rings, shells, superblend mains, valves, guilds, etc. Gearbox completely rebuilt with new bearings; primary has new clutch plates. This bike is registered and ridden by one of the CBE owners. It is, of course, matching numbers and comes with a current Vermont title. Why are we selling it? Why not! We are building another one. We are, in all modesty, one of the premiere Norton shops in the country and have been featured in many trade rags as well as on Cafe Racer TV on the Discovery Channel (now Velocity) building cafe and stock Nortons. 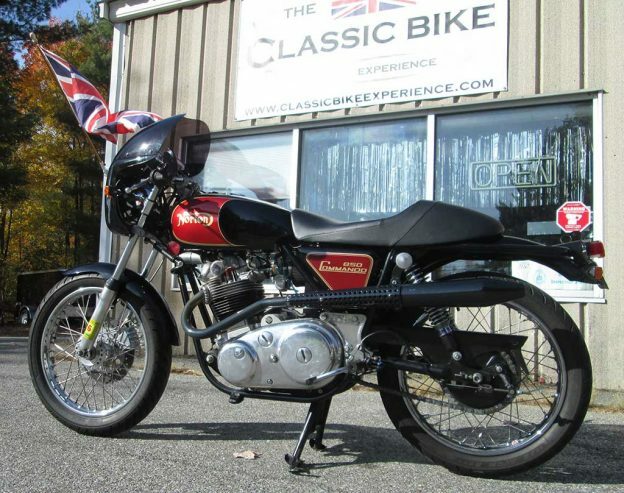 We know what we are doing and you will be thrilled with this bike… even if you have never ridden a Commando. If you are local to our shop, I can offer you several months of “Guild” time wherein you can work on the machine here, learn to maintain it, or just hang out with us. 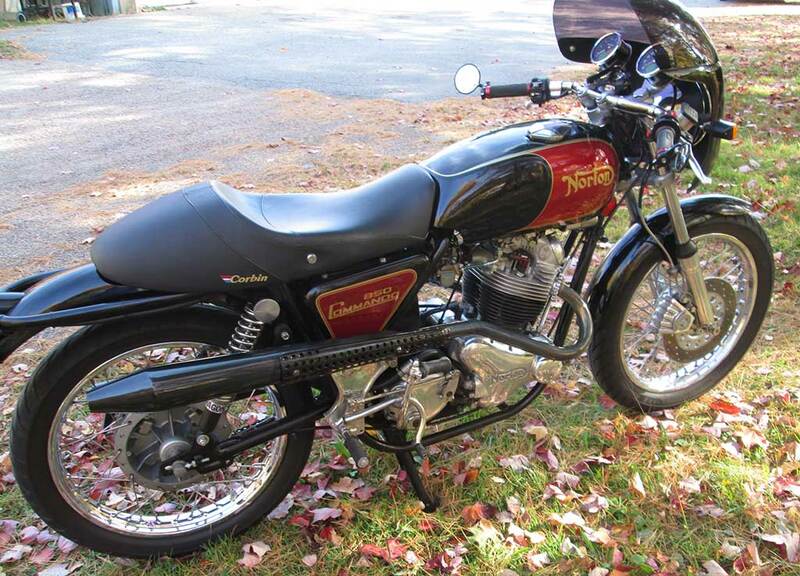 This entry was posted in news and tagged Alton Electric Start, Fishtail Riding School, Norton Commando on January 7, 2018 by Stephen Kastner. Copyright © 2019. The Classic Bike. - All Rights Reserved.